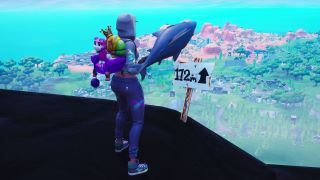 There have always been towering peaks found across the world of Fortnite, and as another week of Fortnite Battle Pass Challenges roll around they feature in their own trial to visit the five highest elevations on the island. Much like the Fortnite furthest North, South, East, and West points that had their own challenge back in Week 2, small notice signs have now appeared on top of the five highest elevations on the island, confirming their status as well as the actual height of the mountains in question. We've been to all five of the peakiest peaks, to bring you their exact locales so you can quickly find them. Let’s get the obvious ones out of the way first. If you’ve dropped into Season 8 you’ll know about the giant volcano that towers over the map - it’ll erupt at the end of the season, watch this space - so head over to the very top of grid H4 on the map. You might need to use the volcano’s air jet to get to the right place, but you’re looking for this little sign that tells you you're 172 meters up. Get near it and you’ll tick off your first location. The second can be found at the island's Season 6 addition, Polar Peak. You’ll find the sign you need in grid C7, right at the very top of the castle that was keeping the Fortnite prisoner locked up. The next ones are slightly trickier as there’s not much different in height between the mountain peaks, but a short hop over from Polar Peak you’ll find the stranded submarine perched on top of an icy peak 130 meters up in grid B8. If you don’t directly drop here out of the bus you’ll need to build up to it, so bring some mats with you. The fourth sign is on top of the mountain in grid B4, northeast of Snobby Shores on the map. Just like before, head on over to it and tick it off - dancing once you reach the summit is entirely optional. And finally the fifth sign is just a short distance away in grid C5, at the top of the stunt mountain peak with the circle of trees. And that’s it - you’ll get 5 Battle Stars for your trouble, which should get you one step closer towards that coveted Battle Pass Tier 100. Working on the other challenges this week? Then make sure you visit a wooden rabbit, a stone pig, and a metal llama in Fortnite and search where the knife points on the Treasure Map loading screen in Fortnite.